BBC NEWS | UK | Politics | Have Short's spy claims hurt Blair? 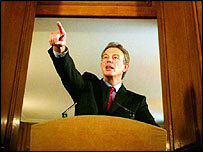 Have Short's spy claims hurt Blair? If Tony Blair is still looking for weapons of mass destruction, he could do worse than cast his gaze onto his own backbenches. For, just as he may have felt he had begun to draw a line under the Iraq crisis, Clare Short has detonated. Until now, thanks in part to Ms Short's maverick behaviour, he has been able to brush her attacks aside with a "Clare will be Clare" shrug. This time, however, the prime minister has been forced to accept things are far more serious, and that action may have to be taken against her. Speaking at his monthly news conference, he effectively accused her of putting national security at risk with her claim that British spooks bugged Kofi Annan. Anyone who attacked the work of the intelligence services undermined the security of the country and was acting in a deeply irresponsible way, he said. Asked if that meant legal action should be taken against Ms Short under the official secrets act, or whether she should be kicked out of the Labour party, he said he would have to "reflect" on the issues. 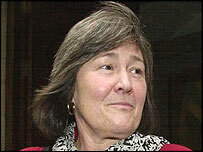 But in this particular political game, Ms Short's future is little more than a footnote. What both her remarks and the collapse of the case against GCHQ whistle-blower Katharine Gun have ensured is that the row over the war and its legitimacy is back on the top of the agenda. And it is still that issue which has the potential to do the prime minister serious political damage. His refusal to make any comment on the affairs, over and above insisting the intelligence services would never break the law, is his attempt to put the lid back onto it. Several times during his press conference he was asked to address the generalities of whether the intelligence services should spy on friends like Kofi Annan, or the UN. And each time he insisted he would not get drawn into discussing the details of intelligence operations because that, too, would be irresponsible and dangerous. And, of course, that meant he refused to comment on whether or not the allegations were true, or whether the services would ever carry out such operations. Similarly, he refused to be drawn on the abandoned court case which has again raised claims that the war may have been illegal and that fact was about to be revealed during the case. The prime minister denied that and continued to express his unbending certainty about the rightness of the war. And he must know that his refusal to get drawn on these hugely sensitive issues will allow speculation to run rife. He said so himself during his press conference. But he clearly calculates that will be a short term setback and that, with no extra fuel to pour on the fire, the flames will soon subside. The real long-term danger for the prime minister is that all this again feeds into the general public perception of how and why Britain was taken to war. In effect, he has asked voters to trust him when he says the intelligence services would never get up to anything illegal.